Life is getting a bit hectic and I won't have access to a computer everyday so I've set Patternmart to only PDF patterns and at Etsy I changed the 3-4 day shipping time to 1-2 weeks. I'm hoping to be able to check mail at least twice a week so it won't really take 2 weeks but just in case something would happen I set it for longer. Wouldn't it just be par for a customer to place an order in the evening the day I check my mail and do packages? Decided it's better to let my customer know shipping times aren't going to be good. 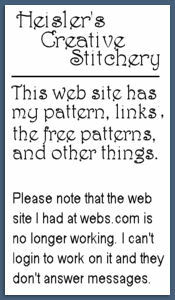 I won't be listing anything at Ebay during this time and my patterns at Patternspot are all PDFs so no problem there. If you need to contact me please go to Etsy and convo me. See the links at the side of the page. If you don't belong to etsy you can try my email but there's always the chance it will get sent to trash, bjh150 at (you know to replace it with @ don't you :) ! ) hotmail.com. Sorry for any inconvenience this causes. Coral Anne is a half doll but instead of being built on a wood dowel and base, she's built on a black metal base. It was a candle stick and is wrapped with tiny leaf garland and pom-poms. This is a new style of hat for me and I really like it. 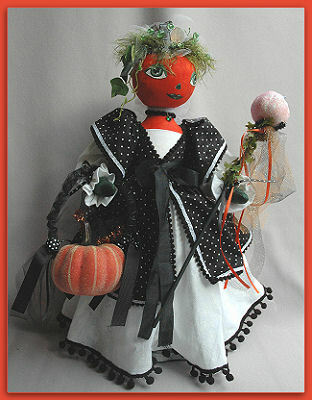 It's decorated with black glass beads, orange and black seam binding ribbon, orange netting, and phesant feathers. 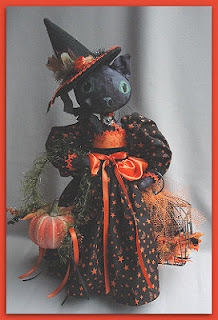 Please have a look at her by searching user name creativestitches at ebay! 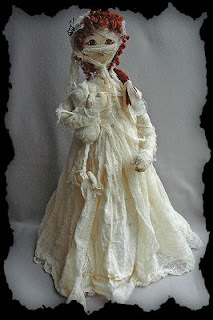 I listed this mummy doll today at Ebay. 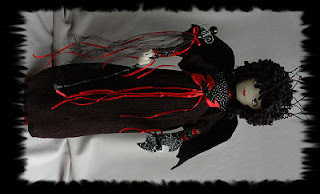 She's another of my half dolls, meaning they have no legs and are built on dowels and bases. Instead of a painted face this one has embroidered features. I did the embroidery by hand for this face years ago and never used it. Thought this would be a good doll to use it for. She's dressed in tea stained muslin and cheesecloth. The muslin cat she holds is sewn from muslin and is wrapped in cheescloth. 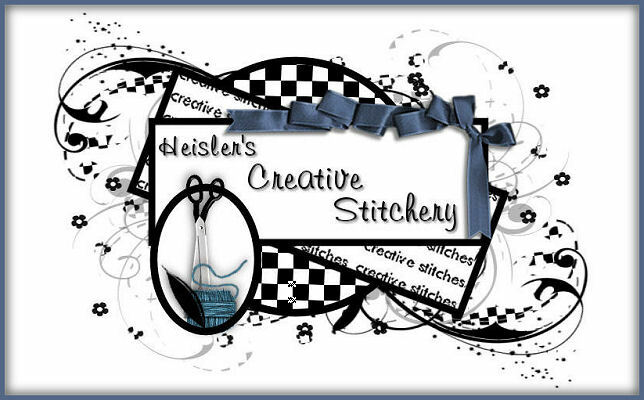 Type creativestitches in the ebay search to find this and my other items. I finished a witch last night and I love her. She's one of those things I make where I'm tempted to keep instead of sell. I'll post more about her when I get her listed. 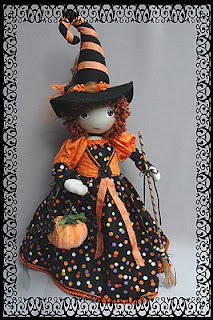 Tonight I'll be working on a new pumpkin lady that's also a witch. If I can get her hat done she'll be ready for her pictures. I'm trying out new shapes of hats and I'm really pleased with the first hat so I'm hoping this shape will be great, too. 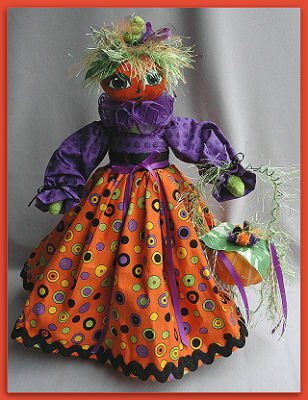 I'm listing Halloween decor at Ebay under the seller name creativestitches. The picture above shows a witch cat holding a metal cage with 2 birds inside. The cat and the others are half dolls. That means they are built on wood dowels and bases. They have no legs but with the base they stand. This is my vampire queen. Yeah, I know the photo's sideways but that's one of the weird problems with blogger. This is Yvette, a pumpkin princess. She has a wire crown. 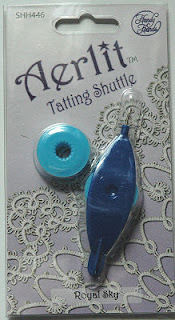 Over at Etsy I put up aerlit tatting shuttles. I have some new colors. If you are a fan of true pink then this is the shuttle for you. Here's a new blue shuttle. Notice that the bobbins are the sky bobbins also used for the carribean sky shuttle and sold as packaged sets of bobbins. 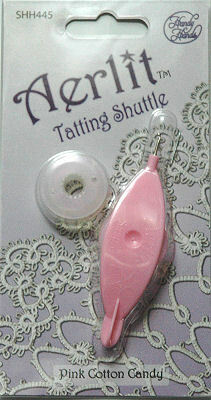 I seldom carry any of the color bobbins but I do can the pearl clear ones for the aerlits.